Compress filers into password protected zip archives. Is there a better alternative to ZipEnc? Is ZipEnc really the best app in Security category? Will ZipEnc work good on macOS 10.13.4? 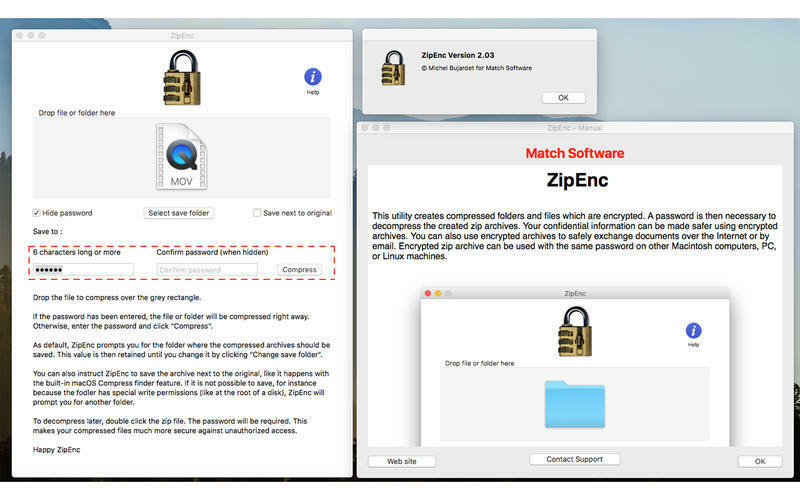 ZipEnc is a utility compresses folders and files into password protected zip archives, using built in features of Mac OS X. Compressed files can be opened on Windows and Linux computers as well. Nobody will be able to extract the content without a password. Safeguard your information not only on your own disk, but also when moving it around through email, on your laptop, removable hard drive or USB key. You can drop several files and folders onto the app. They will be grouped into a zip file called "Archive.zip"
ZipEnc needs a review. Be the first to review this app and get the discussion started! ZipEnc needs a rating. Be the first to rate this app and get the discussion started!